Regulation & Governance. A journal published by Wiley-Blackwell and edited by David Levi-Faur, Jodi Short and Benjamin Van Rooij. Law & Policy. A journal published by Wiley-Blackwell on behalf of The Baldy Center for Law and Social Policy and edited by Nancy Reichman. Socio-Economic Review. A journal published by Oxford Journals and edited by Gregory Jackson, Bruno Amable, Nina Bandelj , David Rueda, Marc Schneiberg. 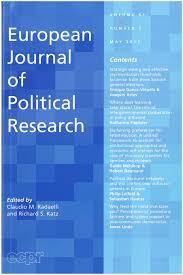 European Journal of Political Research. A journal published by Wiley-Blackwell on behalf of the European Consortium for Polictical Research and edited by Cas Mudde and Yannis Papadopoulos. Recommend a journal of interest to the Regulatory Governance scholarship.